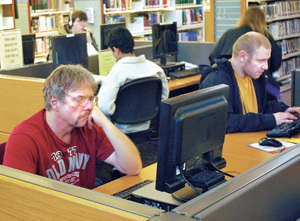 Computers and Information Technology (IT) are often blamed to take away jobs of millions of workers. However, these fellows built of silicon and plastic created many jobs too. Application Analyst: Also called as Application System Analyst is Computer & IT professional who evaluates and designs computer applications to achieve business goals. Applications Engineer: An Application Engineer looks after Design, Development and Implementation of Technology Products. Associate Developer: They help in development phase of computer applications, websites, apps and various other products. Computer Operator: A person with basic knowledge of working of computers. Normally these professionals have basic computer skills like typing document, filling data in spreadsheet, internet browsing and sending emails etc. Computer Repair Technician: A person specialist in repairing Computer Hardware Faults and Software Errors. Computer Scientist: A person who studies about working of computers and make use of available computing knowledge to bring new technologies Computer scientists develop mathematical models to estimate the computer based systems so as to make faster computers. . They eat ‘binary’, walk ‘bandwidth’ and live ‘codes’. Computer System Analyst: They study the functioning of existing business models and bring new changes to generate profits. Chief Technology Officer: In short CTO is the executive level post in company. He / She look after scientific, engineering and technology of the company and bring new innovations. Chief Information Officer: In short CIO also called Information Technology (IT) Director are responsible to keep pace with the information and strive for change for the benefit of the organization. Computer and Information Systems Manager: Also called IT Manager / Project Manager or IT Project Manager is a professional responsible for planning, coordination and implementation of Computing and Information Technology practices. His / Her job is to meet the company goals by organizing resources rightfully. Computer and Information Systems Managers: Often called information technology (IT) managers or IT project managers, plan, coordinate, and direct computer-related activities in an organization. They help determine the information technology goals of an organization and are responsible for implementing computer systems to meet those goals. Customer Support Administrator: A professional who work as support member of a company. His / Her main job involves installation, maintenance and networking of computers. Computer Manufacturers employ support professionals to offer phone support, social media support, email support and onsite support. Customer Support Specialist: He / She answer customer queries about buying computers (computing devices), functions, download and install software programs etc. Database Developer: Also known as Database Designers and Database Programmers. He / She is expert in storing data in different format and management of it. Common responsibilities of a Database Developer include database design and development, writing database applications, test database scripts and technical documentation. Data Scientist: They work with computing research facilities. According to Anjul Bhambhri, vice president of big data products at IBM, “A data scientist is somebody who is inquisitive, who can stare at data and spot trends. It's almost like a Renaissance individual who really wants to learn and bring change to an organization." Read What is a data scientist? Data Center Support Specialist: They specialist in monitoring, maintenance and management of database in a very large computing environment. They have to user generated issues with greater efficiency. A Data Center Support Specialist is “watchdog’ in a Data Center Environment. Data Quality Manager: Experts in verifying the reliability and effectiveness of data in a larger data environment. Developer: Also called Application Developer / Software Developer is Computing & IT Professional who can develop applications for public or private use. With the rise mobile computing, the demand for Application Developers is high. The work of a Software Developer includes research, design & development, implementation and testing of software programs. Full Stack Web Developer: An expert Cross Functional Areas of Computing & IT who work as both Front-End Developer and Back-End Developer. They design, develop, implement and test applications to meet business goals. This list is indicative only. You are invited to expand this listing. Please send your suggestions through Contact Form provided below this post.